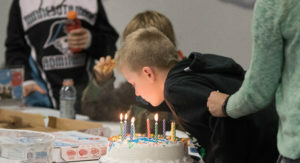 Looking for places to play Nerf in MN? Not ready to play paintball? Want to get the rush of close quarters combat but worried paintball hurts too bad? It’s okay – We totally understand the perceived bruises and sting of paintballs. We used to think the same. We used to host Nerf Parties for ages 6 and up until we found out about Low-Impact Paintball! We found that most of our Nerf MN parties ended up either switching to low impact paintball by the end of their party or just watching paintball from the sidelines. 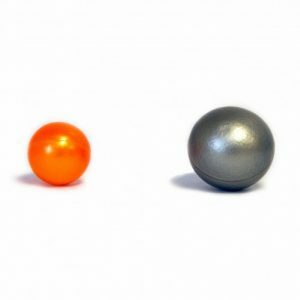 A low impact paintball fired at the traditional speed has approximately a 1/3 of the impact force of a traditional paintball shot. BUT we even shoot them slower because so easily making the sting 68% less than an average paintball. Play against your friends or foes behind inflatable bunkers and not your house! 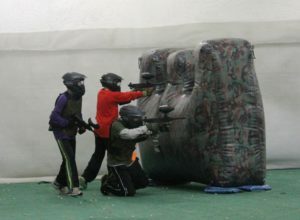 Hide, dodge and duck from paintballs in the best indoor Nerf MN and paintball field in MN! Multiple games options including Death Match, Headquarters, Capture the Flag and more! Have a Nerf gun? Leave it at home. We have all the gear you’ll need including party space! Each party gets a table for food and decorations! Also, don’t worry about staining your clothes…our paintballs are non-toxic and wash out of your clothing unlike outdoor paintballs.